Kamag and Scheuerle Self-Propelled Modular Transporters (SPMTs) were used to move a load of over 15,000 tons as part of a spectacular project. With an accuracy level of just 2 millimetres, this required absolute precision work. Continental Industrial Tyres developed a tyre concept specifically tailored to suit such tasks and supplied the complete wheel units required. Aker Stord, Norway's largest shipyard, is located in Leirvik on the island of Stord. This is where the world's mightiest oil platforms are built and fitted out. For the specialist transport companies involved, the order was both straightforward and demanding: an oil separation plant built by Aker Solutions for treating waste water was to be moved from the production site on to a pontoon, where it had to fit exactly. The plant, which was made up of three sections, was impressive in its size, with the middle section alone weighing 12,750 tons. For such mighty tasks the Continental IC 40, size 355/65-15, is an equivalent partner. This crossply industrial pneumatic tyre has proved itself in the most arduous applications under the toughest of conditions. The mega project was carried out by the Belgian heavy haulage company Sarens. 356 axle line modular transporters and 16 KAMAG Power Pack Units were still not enough to transport the enormous load. Only with the 184 additional SCHEUERLE axle line SPMTs and 6 PowerPack Units, hired from the heavy load transport company Mammoet for this transport job, were the technical conditions created for implementation of this ambitious project. 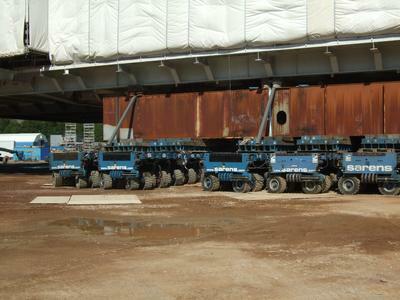 The KAMAG and SCHEUERLE Self-Propelled Modular Transporters (SPMTs) were then electronically interlinked and moved under the 85.3 metre wide and 67.5 metre long load via remote control. Using all the power available the load was then lifted to transport height, again via remote control. The actual moment the load started to move was breathtaking for all involved. 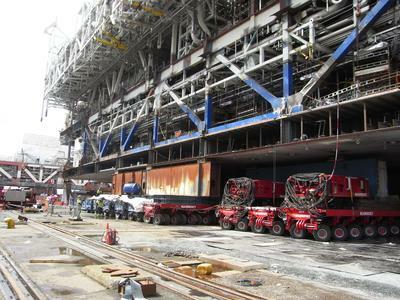 The 15,000 ton load was to be moved out of the shipyard driven by 9,400 hp. All 2,160 wheels turned 90o synchronously and after travelling 40 metres diagonally, the first part of the journey was complete. Then the challenge was to reach the pontoon. Once again a multitude of wheels had to turn. This time after 120 metres of moving straight ahead the objective was finally reached! With extreme precision the three individual sections of the mighty oil separation plant were lined up together. The precision work with which the project had been successfully carried out was fascinating! SCHEUERLE and KAMAG transporters have a global reputation for firstclass technology and exceptional product quality. Reliability in daily operations, high load capability and a long service life make these vehicles an important element in today's logistics processes. SCHEUERLE and KAMAG are both names which feature prominently in the history of the vehicle technology involved in heavy load transporters. 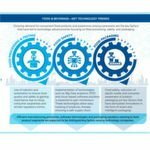 Both companies incorporate tradition and innovation; together with NICOLAS Industrie in Champssur-Yonne, France, they are part of the group of companies belonging to multientrepreneur Otto Rettenmaier, based in Heilbronn, Germany. The group's heavy load sector 'TII Group - Transporter Industry International' is a world market leader. 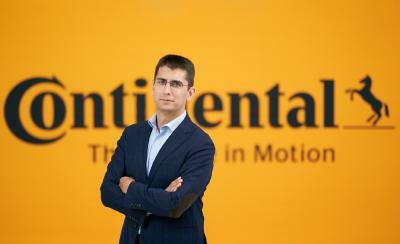 With sales of approximately €20 billion in 2009 Continental is among the leading automotive suppliers worldwide. As a supplier of brake systems, systems and components for powertrains and chassis, instrumentation, infotainment solutions, vehicle electronics, tires and technical elastomers, Continental contributes enhanced driving safety and global climate protection. 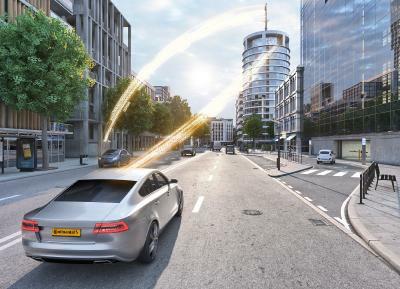 Continental is also a competent partner in networked automobile communication. 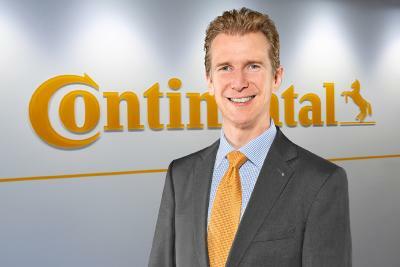 Continental currently employs approximately 134,500 in 46 countries. The Tyre Divisions are an Official Sponsor of the 2010 FIFA World Cup South AfricaTM. For more information, visit the websites www.ContiSoccerWorld.de, www.ContiFanWorld.com, www.conti-online.com.